Have you ever read or been told, something like this... ? "An osprey's daylight distance vision is six times sharper than a human's, under the same conditions." The popular comparison between bird vision and our own overlooks two very important factors. One is the laws of Physics, which I'll come back to in a moment. The other is that our human visual system is, in fact, phenomenally good – better than any other primate and (in daylight) inherently superior to most other land-based mammals. We take our eyesight for granted, without appreciating some of the features that make it so awesome. (At least, we do until we get older and it doesn’t function quite so awesomely as it once did.) Humans can see in three colours, whereas most mammals see only two. We can obtain independent images from both eyes but, unlike birds, our eyes constantly (and completely automatically) scan the entire field of view. This saccadian movement as it is known, is powered by special extra-ocular muscles which can move each eye from any direction in the field to any other, in about 90 milliseconds. Processed by the visual cortex in our oversized brains, this gives us the effect of a full-colour high-resolution view over 120 degrees of visual field. It's believed that the amount of neural capacity dedicated to this is so great that only ourselves, the other large apes, and some whales and dolphins have large enough brains to manage it. But back to the physics. The exaggerated claims that large raptors can see 5, 10, 15, or even 20 times better than humans seem to be based on two different discoveries. One is that birds have more densely-packed retinal cells than we have and (in some species) many more of them. The other version of the myth cites the fact that birds' eyes are much larger, in proportion to their heads, than our own. And therein lies the error because, when considering the absolute resolving power of an eye, neither of these things matters worth a hoot. A human eye has a variable pupil diameter in the range 2.5mm to 5mm. That's about the same as an osprey or European buzzard, but smaller than the golden eagle (up to 6.5mm). However, human eyes never reach the problem area of the diffraction limit because our spherical eyes have a focal length of 17mm. 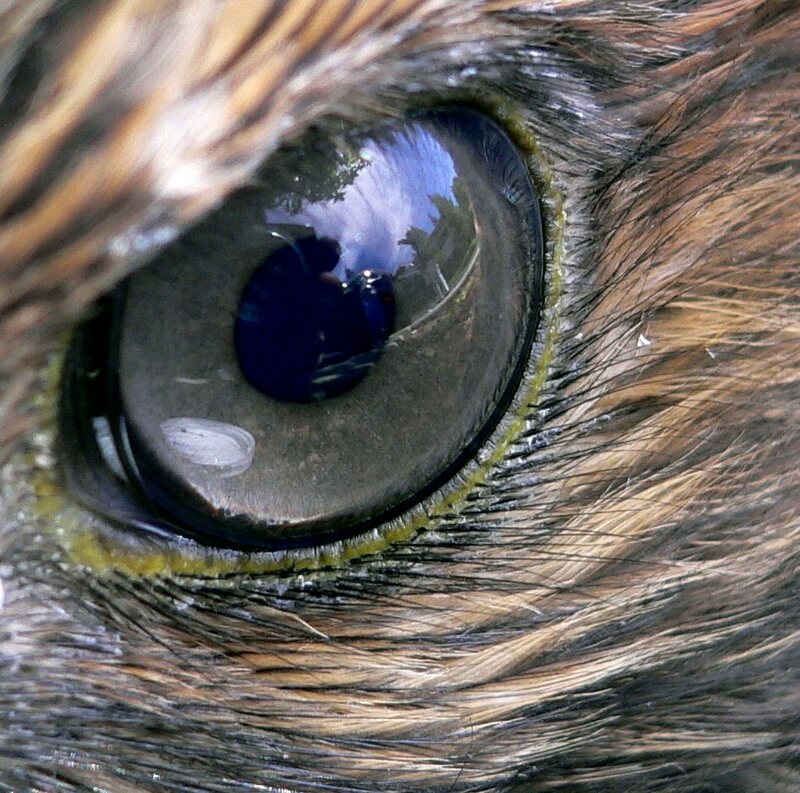 Birds of prey eyes have a kind of tubular shape in cross-section, giving them a longer focal length. In effect, raptors have magnifying eyes. (But with a reduced field of view.) In large species, these eyes are probably running right up against the diffraction limit, with a resolving power equal to approx 0.3 minutes of arc. But that's IT. The only way to get improved visual performance beyond this is to have larger eyes. 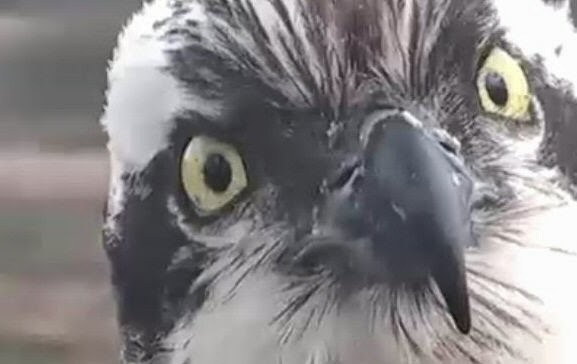 If an osprey really DID have six times better distance vision than a human, its eyes would have to be the size of tennis balls – which clearly they aren't. It's time to knock this one on the head: Sparrowhawks and falcons have similar distance vision capabilities to ourselves; ospreys and buzzards about twice as good; eagles from 2 to 2.5x for the largest species. A technical but still quite readable article, which enlarges on some of the points mentioned here. Great piece. I wonder with a doubling of acuity, how does that change the useful vision in quantifiable terms given the inverse r-square law of light propagation. "Seeing" an object half as big at the same distance might not equal seeing an identical object at twice the distance. Or does it? I have a question about another aspect of osprey vision. Humans employ polaroid lenses to reduce glare in environments where ospreys hunt. Do ospreys' corneas have a "polaroid" attribute? Thank you. ARE BIRDS TIRED AFTER MIGRATION? (c) Wildlifewriter 2013. Simple theme. Powered by Blogger.